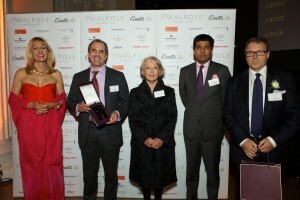 Virtuous Retail, an institutionally owned developer-operator of community-oriented premium Lifestyle Shopping Centres in India’s top cities sponsored the Best British Luxury Brand Overseas Award at the 2012 Walpole Awards for Excellence held at London recently. This is the first time that any Indian company has sponsored this category at Walpole. Jaguar was announced the winner in the Best British Luxury Brand Overseas category. The category shortlist included competition from British luxury brands Burberry, Dunhill, Johnny Walker and Rolls-Royce Motor Cars. It was Jaguar’s outstanding achievements in international markets, the strength of design and new product launches, significant investment in the business and importance to British exports that impressed the judges. This year’s Walpole award winners represent some of the most talented organisations from across the luxury industry and we are delighted to recognise their exceptional achievements. The British Luxury Brand Overseas Award recognises outstanding achievement by British luxury brands in international markets and Jaguar is a highly deserving winner of this award. We are pleased to have had an opportunity to support Walpole and be part of a celebration that recognises outstanding achievements in the luxury sector from around the world. I also think our participation has helped reinforce India’s enduring relationship with British luxury. As a consumer market, India is best positioned as a platform for luxury brands looking for sustainable future growth; we look forward to working with Walpole to bring British Luxury to our pan-India portfolio of lifestyle retail centres across India’s top cities. Over 500 leading figures from the British and International luxury industries attended the event.